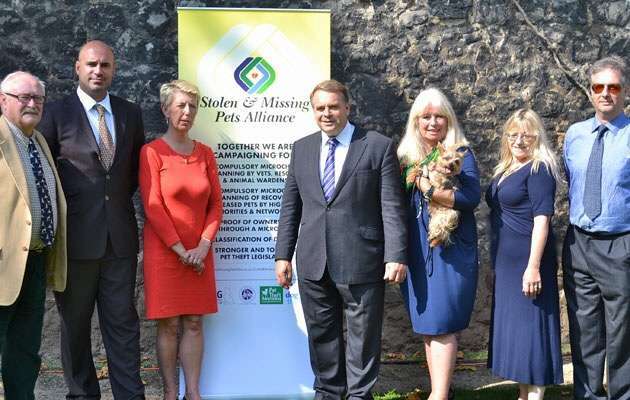 In September 2014, Stolen and Missing Pets Alliance (SAMPA) was launched at Westminster, we were delighted that both Neil Parish MP, Chairman of APGAW and Angela Smith MP, shadow Defra minister were present, together with our great champion of dog welfare, Marc Abraham, PupAid. Both MPs agreed that there was a definite need to change the sentencing of pet theft and both agreed to support SAMPA’s submission to the Sentencing Council on a cross party platform by writing to the Council endorsing the need to reclassify pet theft and to have a custodial sentence. Today is another positive step forward in our campaign to get better penalties to deter pet theft and also help reunite missing microchipped pets with their families. Our campaign for this and the compulsory scanning and checking of microchips starts today. Main picture left to right: Arnot Wilson, Dog Union; Marc the Vet, Pup Aid; Angela Smith MP, shadow Defra Minister, Neil Parish I MP, Chairman Associate Parliamentary Group for Animal Welfare; Debbie Matthews and Gizmo (reunited stolen dog), Vets Get Scanning; Nik Oakley, Doglost; Richard Jordan, Pet Theft Awareness. Dog Theft has increased by 24% over the last three years and no-one is safe from this crime which hits families, the elderly, the disabled and the homeless. In reality more that 60 dogs are snatched every week in England and Wales. Dogs are stolen from, gardens, houses, parks, kennels, outside shops and cars. Nowhere is safe. They can be any breed, but designer toy breeds and gun dogs are particular targets. Thieves even take litters of puppies. Rewards for return can be demanded but most dogs are sold on or used for breeding. It is law to microchip all dogs but a microchip is not proof of ownership and there is no law to make it compulsory to scan and check that dog and owner match, leaving huge loopholes preventing the reunification of stolen and missing pets. Sadly dogs are regarded as just goods and chattels and not a family member. Any punishment is based on their monetary value alone. The heartbreak and distress isn’t considered. We need the Justice Department and the Sentencing Council to recognise the problem, and provide a real deterrent to dog thieves and their heartless crime. 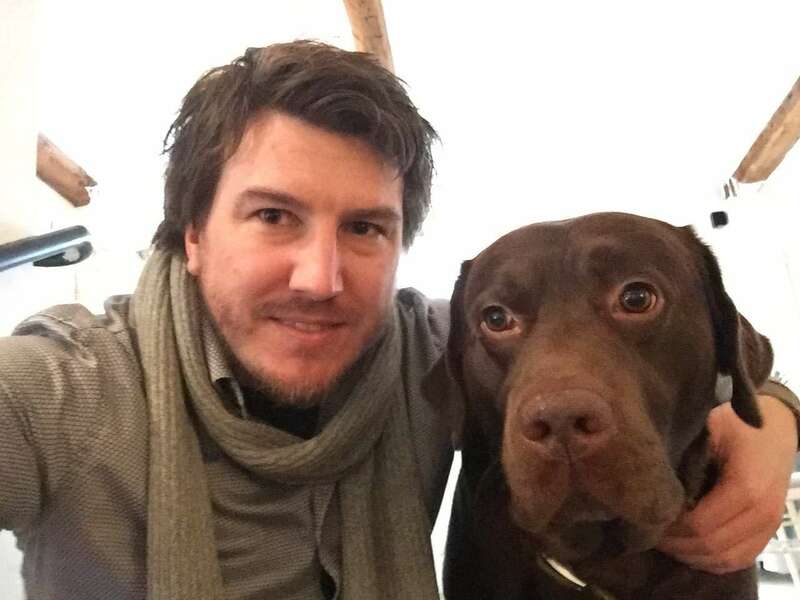 Dr Daniel Allen is an Animal Geographer interested in the cultural significance of animals around the world. An academic, author, animal welfare advocate and otter specialist – Daniel’s balanced perspective and thoughtful approach is widely acclaimed. 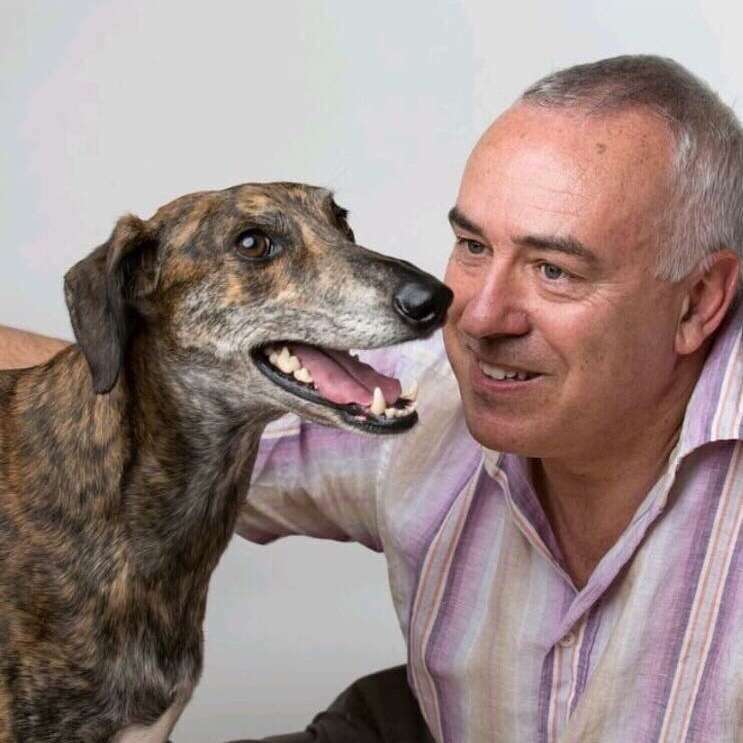 Legal Adviser Professor John Cooper QC ”I am very pleased to have been asked to advise upon the drafting of the Pet (Theft) Bill, which will properly recognise what every pet owner in the country has always known. That is that our pets are not inanimate pieces of property, but sentient, caring, animals that are an integral part of our homes, the theft of which should attract far more serious sentences to adequately reflect that. Good advice from Dorset Police’s rural crime team who have advised owners not to leave dogs unattended if at all possible. Dog owners should check home and garden boundaries and make sure gates and entrances are locked. Ideally, any kennels or pens should not be visible from the street. Any outside kennels need to be alarmed and securely locked. Pens with no roof can be easily accessed and a dog pulled from a pen. A spokesman said: “How easy is it to walk in or climb over your fence? Apart from the obvious fencing, where possible put up trellis on top or against wooden fencing, to make it harder to climb over. Plant thick thorny high shrubs. “A padlock or chain can be bolt-cropped in seconds so are you going to hear this when fast asleep or at the shops? Ensure you have PIR type alarm systems protecting your premises inside and outside.”PIR alarms are activated when invisible beam is crossed and an alert is then sent to the owner or a visible alarm is activated. Officers warn against advertising on social media and telling others about your dogs. If you have a cold caller at your door about another matter, do not tell them about your dogs, even if asked. Some offenders may enquire at the door and be checking out your premises as they talk to you. Get a warning poster from police or Trading Standards to display outside that cold callers are not welcome. Be vigilant when using social media sites like Facebook and Gumtree, where puppy and dog ‘sellers’ and ‘rescues’ are selling stolen dogs or dogs in very poor health and are out to make money from a ‘donation’. A spokesman said: “Only use official rescues with a good reputation – research them first. • If your dog, cat or horse is lost or suspected stolen, it is important to act quickly. • Report the loss to your local council’s Animal Warden and those in all other neighbouring local authorities. • If you believe your pet has been stolen, report it to the police and insist you are given a Crime Reference Number (CRN). This will help you at a later date should your dog be found with a new owner. • Report the loss/theft to the microchip database, this will ensure that if anyone tries to re-register the chip number, you will be informed. • Use social media; Facebook and Twitter has proved to be successful. • Make sure local vets are aware in case someone takes your dog in for treatment, if they have been involved in an accident. • Visit places where dog walkers go such as local parks and public places and talk to people, asking them to keep an eye open for your dog. • POSTER, POSTER AND POSTER AGAIN. Keep your dogs/cats microchip number and microchip database phone number in a safe place! Add your dog to your mobile phone contacts and include along with their microchip number and database contact info, insurance policy number with the contact number and the local dog wardens numbers. * Neuter your pet as this can reduce the likelihood of roaming and make them less attractive to pet thieves. Dogs are likely to be sold on if neutered but used for breeding if not! * Make sure your pet is wearing a collar with an ID tag and that it is up to date. It is a legal requirement for a dog to have an ID tag with your name and address on it. We also recommend including your mobile phone number on any ID tag as this can help reunite you with your pet quickly should they ever get lost. * Microchip your pets . It has been a legal requirement to have your dog microchipped in England and Wales since April 2016. Please check that your dogs chip is registered with up to date contact details, since the new legislation was introduced there have been many mistakes made by the databases. If you have imported or bought an overseas puppy/dog you must register the microchip on a UK database. • Decide who owns the dog in your household. Discuss who would own the dog in the event of bereavement or break up and draw up documentation to this effect. This may seem unnecessary, but pets can become the centre of ownership disputes in these circumstances. DogLost Award-winning DogLost is the country’s premier pet reunification service. Its automated alerts and poster generation is supported by a network of volunteers who offer advice and support on the ground as well as the website. It works closely with the police, dog wardens and rescues and it is at the forefront of fighting back against the rising crime of dog theft. The service is entirely free to owners and it helped more than 12,000 last year. Pet Theft Awareness This is our chance to highlight to a wider audience the misery that thieves are causing by stealing pets and horses. We have three main aims: Prevention, guidance to victims, and to campaign for tougher laws. If you own a pet the chances are that someone else will want it! Some will be irreplaceable pets and many will be highly trained and valuable working dogs. 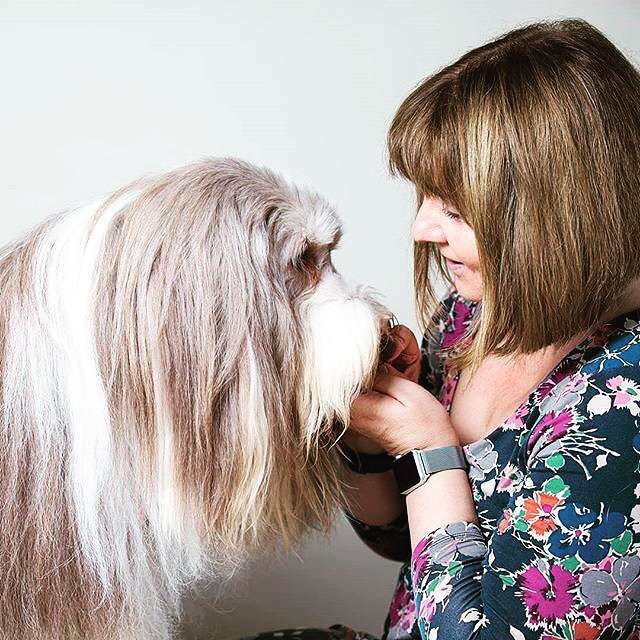 Vets Get Scanning When Sir Bruce Forsyth’s daughter’s microchipped dogs were stolen in May’06, the family found out how the microchip system in place was letting responsible pet owners down. They have been campaigning to get compulsory microchip scanning by vets, rescues, dog wardens and other authorities dealing with deceased pets. You only find out how microchipping does not work when your pet goes missing!